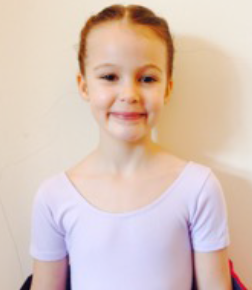 Lucy James is only seven but has been dancing with Miss Emily/Charlotte for nearly four years now! On November 21st, she did her very first RAD ballet exam and she sat down with Miss Angie afterwards, to tell her all about it. “I felt wobbly” Lucy said, when they first started talking about going for the Primary exam, back in January. But Lucy, along with her friends Louisa, Emma and Bella, spent months preparing, to make sure there were no wobbles on the big day. In fact, she practiced so much that sometimes, whilst watching Strictly, her arms would start dancing without her even noticing! Exam day started bright and early. And as the girls sat having their hair French plaited and clipped into place with lilac flowers – brand new satin ballet shoes on their feet – the energy in the changing room was electric. The excitement (and nerves) built, as the four girls lined up outside the hall. But Lucy said the nerves disappeared when she started dancing, and having her three friends in there with her made it a lot more comfortable. Lucy and the girls performed 14 dances (14!!!) in total. Lucy’s favourite being the transfer of weight routine because it’s all about chasing butterflies! 30 minutes later, the girls were beaming as they skipped out of the hall to their markedly more nervous parents. “It was really fun!” said Lucy, and everyone agreed that the examiner was lovely. Lucy and her 3 friends ALL achieved a Distinction for their first ever Ballet Exam, and we would like to congratulate all of our exam students who recently took their RAD Primary or Grade 1 Exams. As a School we are thrilled to achieve 12 Distinctions and 3 Merits in our latest Exam Session! Lucy is already looking forward to preparing for her next exam. She’ll be moving into the Grade 1 class with Miss Charlotte. Lucy and Jenny wanted to say a big thank you to Miss Emily and all the teachers for the hard work they put in to the preparing everyone for the exams.